Kids love getting clean with Kandoo. Our flushable wipes clean tiny booties up to 30% better and make wiping easier and more fun. Consider this compact tub your kid’s partner in clean. 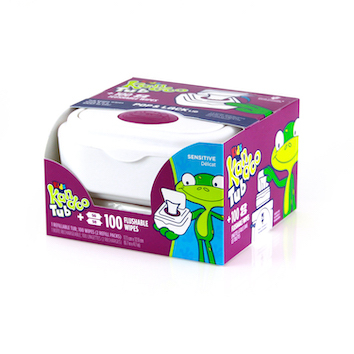 It’s kid-friendly design lets your kids access Kandoo Flushable Wipes that get them cleaner. Pick a refill pack made just for the reusable tub, so you'll never run out of wipes. Convenient flip-top packs make on-the-move clean-ups a breeze. A SNAP to use with little hands! Free from parabens, chlorine, sulfates, phthalates, and drying alcohols. 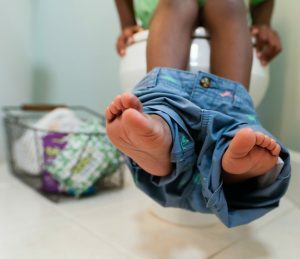 Give your kids Power Over Poop. Check out these tips and tools to potty train with confidence, less stress--and less mess! Flushable Wipes - Tub is rated 4.8 out of 5 by 654. Rated 5 out of 5 by angelbell from Great Clean Feel So I was always seeing Kandoo at the store when I went to buy baby wipes and finally decided to try them. I have to start off by saying the price was awesome!! We love a great product with an even better price. Next we got them home and my son was the first to use and he loves how clean they made him. He is 8 but hates toilet paper so Kandoo does a great job for him. My son said he likes how they smell yummy as well. My daughter who is potty training found these easy to use because the wipes tub was easy open for her and that makes things so much easier. All in all Kandoo has made a great bottom cleaner with an awesome smell and easy storage! Rated 5 out of 5 by Jennylynp from Perefect for little ones I bought this product about 3 wks ago and am happy i did. I placed this contanier in the bathroom and it is perfect for my little daughter to use while going to the restroom. Sometimes things can get very messy and love the fact that it is flushable. The wipes are a nice thickness, it is thick enough to where it doesn't ripe, which is one of the reallt good features. The smell is a nice soft scent, very light. I loved this product so kuch I went back to buy a couple of more to keep on stock. It's also great to tale with you to the park, beach or just the store for easy cleanup. I really like this product. Rated 5 out of 5 by kinsylyn from Keeping My Boys Clean! 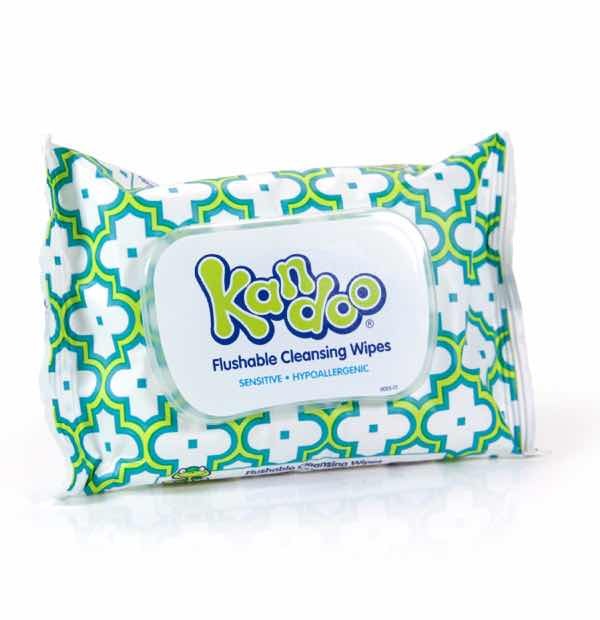 I am so happy that I had a chance to try the Kandoo flushable cleansing wipes. My 8yr old son is still struggling to fully clean his bottom after going poop. He overuses toilet paper and parts of it tears and makes a huge mess in the bathroom. Worst part is that he still isn't clean. He comes later itching or needing a shower...lots of times I just find him walking funny. So, this forces me or dad to have to go wipe him everytime. Kandoo wipes have given him the independence and cleanliness he needed. He is able to do it all himself. And the kid-friendly packaging has encouraged him to use them. He doesn't feel ashamed and thinks that it is cool to use. Rated 3 out of 5 by Lisa2008 from Great product, but poor container I purchased this product a month ago for the first time. I was happy with the quality and size of the wipes, but I was frustrated with the container they came in. The look of the container was great, but I the lid would not stay shut. I would have to press it shut at least 5 times each time they were used. There just didn't seem to be a proper latch to hold it closed, and ultimately the wipes dried up on me because my daughter would walk away after fighting with closing it and not mention to me. I just found it pricey compared to other similar products, and I thought the container would have worked better. Rated 5 out of 5 by Kmh92 from These are amazing! I started to use these shortly after my daughter started to potty train. At first we were using regular wipes which we all know are not flushable. I went on the search for a flushable wipe for the remainder of our potty training days. We then came across Kandoo. I have not had a problem yet. 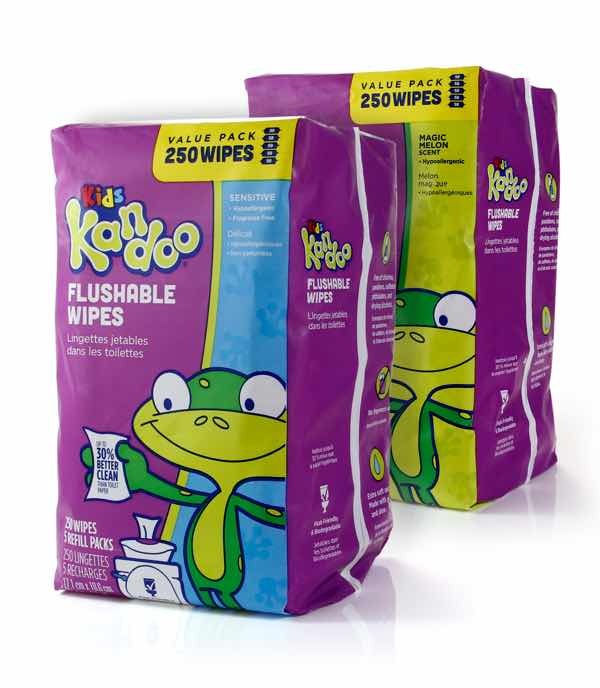 We are still potty training and ALWAYS have Kandoo flushable wipes in the house, the car, and the diaper bag. I recommend these to every friend with a potty training child. The attached picture is from when I first discovered Kandoo and fell in love. I had to get as many as possible to stock up for a little while! Rated 5 out of 5 by Happygrandma2 from Kandoo can do !!! This is a wonderful product for several reasons. First, I love the packaging with the stickers. My 4 year old grand-daughter is autistic but very high functioning, she loves stickers, I let her know this was her present and she could decorate it all by herself. Because she was able to do that she is more conscious of using the wipes, because she knows they are hers. Second, the push button is easy for her to use and it works every time this makes her proud of herself because it's her accomplishment. Third I love the fact that the little sticky that keeps the wipes from drying out you made them in such a way that her little fingers can stick and unstick it very easily. This is a great product ! Rated 5 out of 5 by Junebugsmom from KANT-DOO without these!!! Recently my ds nursery required him to transition to flushable wipes. He has extremely sensitive skin (mild eczema). I was really concerned about not being able to find a substitute to our beloved pampers sensitive non-flushable wipes that we used since birth. My options were very limited. Most flushable wipes are scented or unaccommodating to allergenic skin. So,desperate to find a replacement, I stumbled across these and they have been a godsend. No adverse reactions and they are priced reasonably (when stacked with coupons.) I KANT- DOO without these wipes; they are gentle on my dear son’s skin, packaged compactly for ease of transport and are assisting with our transition from diaper changes to potty training. Rated 5 out of 5 by Desiray82 from Clean Bums I love these fantastic #kandoo wipes! My kids really enjoy using them, and of course they get the job done. The smell is awesome, fresh, and clean. The cute little wipe holder keeps them nice and moist and easy to use for little hands. The best part about this product is not having to spend endless cash on toilet paper for their bottoms. I gotta say my children will use an entire roll for one bathroom visit, and my pockets can't keep up. Thank you Kandoo for saving this mom lots of money and still getting lots of uses from a 50 count tub. This product is so worth it.